This lesson introduces forecasters to the complex and multifaceted process for creating a forecast. It also discusses how NWP fits into that process. In addition, the lesson provides a broad overview of the basic components of NWP and how they combine to produce a model forecast. Explain the role a forecaster plays in the use of NWP. 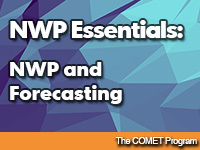 List the components of an NWP model or ensemble forecast systems. Explain how models generate a forecast. Describe when and how to use NWP guidance in each step of the forecast process. Explain why some atmospheric processes need to be parameterized in NWP models. List at least four processes that require parameterisation in NWP models and ensemble forecast systems.